This smart bike jacket is genuinely smart, it looks cool, cost a few bucks and the designers did a good work slapping some Bluetooth technology in to it. But what am yet to find out is what challenge exactly the Gadget was meant to address. It certainly glows a lot, at least that much i can tell, but that’s probably all i can say for now. You won’t probably find it on the shelves of your local bikers store, but that’s because it’s still soliciting for funds on the pages of crowd funding site – kickstarter. Lumenus Smart Jacket by Lumenus is darn awesome, it might be a little more awesome if you are planning on driving a bike on roads with bunch of traffic insensitive and blind jackasses. Lumenus isn’t really new to the smart clothing chessboard, In addition to the jacket, the Los Angeles-based tech company has a range of smart clothing and wearables planned, including vests, shirts leggings, backpacks, armbands aand wristbands. All of them are either already unpacked or about to be on kickstarter. Its probably nothing like the Dainese Mikano 1000 airbag jacket that does more than just glow or something, but Lumenus smart jacket is an attempt to ‘kill’ what has been ‘killing’ lots of bikers – the visibility factor. Until recently, bikers used hands to indicate turn signals, but at night things got a little ‘visibly’ nasty. 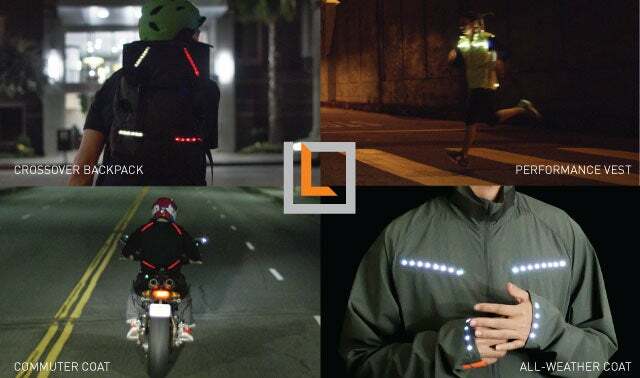 Lumenus smart jacket is designed to improve visibility at night and accurately indicate turning intentions to other bikers or motorist. Its virtually a bunch of signaling lights strap to your regular jacket, strapped in way that makes it no so regular. Unlike other existing smart clothing that attempt to solve the same problem by flipping switches everytime a biker wants to signal, the Lumenus smart jacket takes a slightly different approach. Why use a smart jacket in the first place when you have to keep fliiping switches to indicate turning intentions or other signals? This is the 21st century for Pete’s sake! Rather than employ manual switches, the Lumenus Smart jacket uses Bluetooth technology to connect your smart phone to your jacket. Connecting your smartphone to your jacket pretty much sound like a sentence I shouldn’t have made, dump and irrelevant as the concept seems at first, it pretty much does a good job – save your life, You never know when that turning signal will be critical to a crash free journey. Our smartphones comes with aaccelerometers, Bluetooth and GPS, well that’s enough gizmos for Lumenus smart jacket to work with. When the cyclist approaches a turn on their preselected route, LEDs in the left or right cuffs will flash to indicate to the cyclist where and in which direction they should turn, while LEDs on the front and back of the jacket will relay these turning intentions to following bikers or motorists. Also, when the phone’s accelerometer detects sudden deceleration, the LEDs will light up to indicate braking. Lumenus claims the jacket is waterproof and washable, and that its battery pack enough electric juice to last for up to 30 hours per charge. Am not a smart clothing guru or geek, but given the need for visibility the smart jacket should have probably been made from more visible colors than black even if the intentions of the designers were to dull out background lighting to enhance the glowing LEDs. And like I said, we don’t really know much about the smart jacket retail price, but Lumenus smart clothing retails for a minimum of $100 to a maximum $500 dollar.